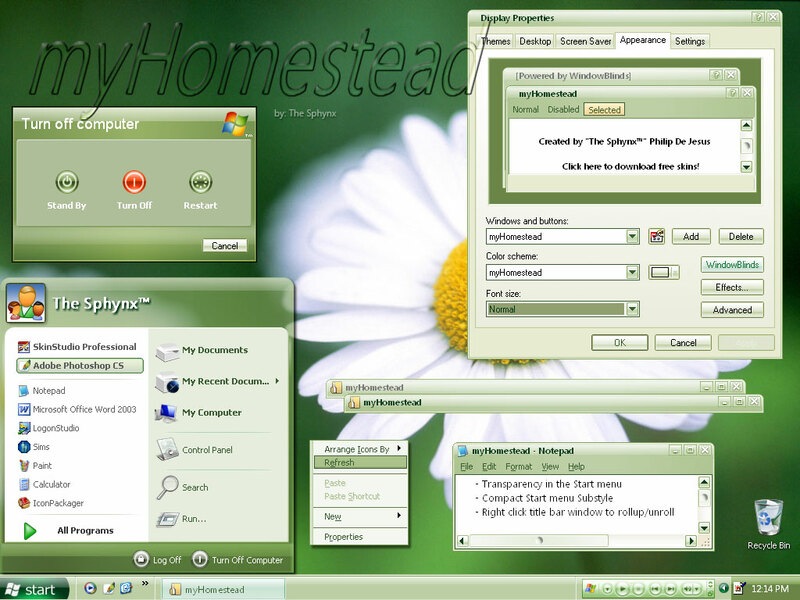 myHomestead is actually a recolor of myLonghorn Windowbinds Skin Link . However, this one is certainly different from myLonghorn in a number of ways. So instead of releasing it as an updated, I decided to release it as a separate skin. Perhaps you are wondering why I named it such. Well, remember Olive Green Visual style by Microsoft ;) , its shellstyle is named Homestead. I like its green color because it’s easy on the eyes. That inspired me to recolor myLonghorn to green and name it, instead of Olive Green, myHomestead :HOT: . Now that it’s done I give it to you. I enjoyed using it and use it more frequently than myLonghorn :LOL: . I do hope you will like it as much as I did. And comments please. Thank you. Love the star menu on this and you made a compact menu. Saved me the trouble of messing with it ! Not a fan of green, but you pulled it off nicely here. Well done. I love green. Gorgeous skin - I'll be using this. Thank you! I love it !!! With the dropsonleaf' wallpaper on your link, my desktop is simply gorgeous. I really like this WB, almost as much as MyLonghorn, but I am experiencing the same problem with both - to the left of All Programs the border is indented slightly and when mouse over is activated the highlighting is off-center. This may very well be the bug which you fixed for MyLonghorn, but not for me. Presumably as nobody else has mentioned this, it must be my setup! Excellent blind, and your skill is apparent. Very nicely done, Sphynx. I really think you could do a nice job to complement the next Dragon Desktop. I love it keep it up!! How did you make the transparencies in the Start Menu? Looks very well made Sphynx and I do not see the problem with the all programs as does longoff - must be his system then. Just that the logoff and restart buttons in the start menu - the highlight could of matched a bit better or even a button effect would be even better. But this is a very good and useable WB. Very excellent work too! Hey Sphynx, this is an excellent wb. Using it right now, matter of fact. Very clean and classy imo - thumbs up!